Price: $428 Most supplies, daily lunches, drinks & snacks are included. 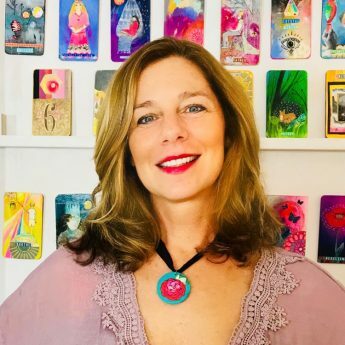 Get ready for a weekend of pure, joyous mixed-media exploration as Cathy leads you through the process of manifesting your own unique 25-card oracle deck. In our time together, you will reconnect with your expressive, intuitive self and the magic you carry within. We will use paint, color, chance, synchronicity, storytelling, and the wisdom of ancient divination to guide our journey. 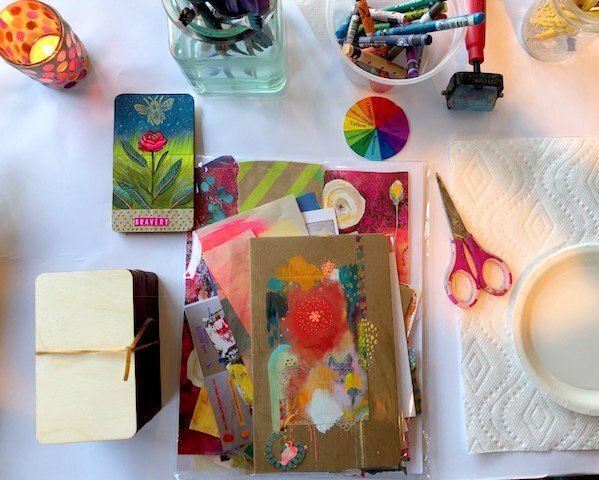 Our gathering of creative energy will be a safe space for artists of all abilities. 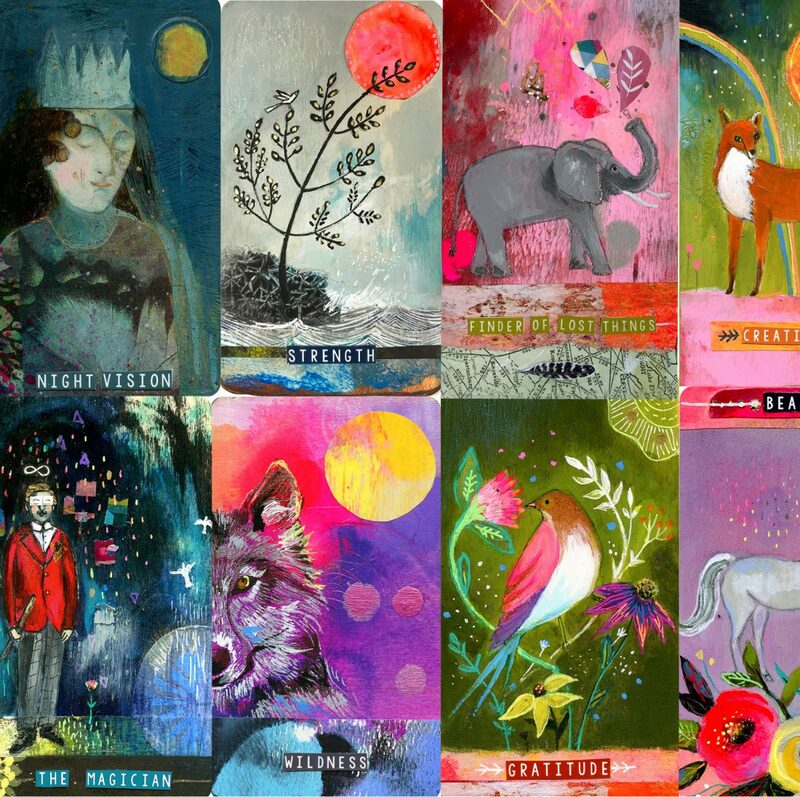 You will create an original deck based on your own level of experience and infused with your artistic voice. 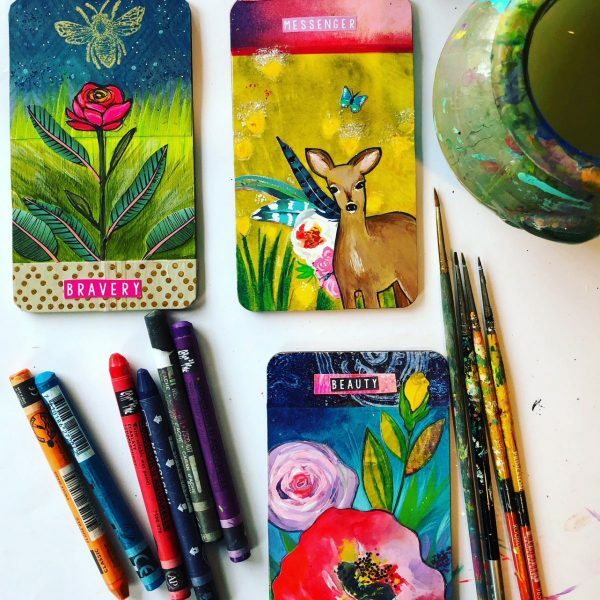 We will begin the evening Thursday, July 11th from 4-7 PM with our Divine Spark Soiree – a special ice-breaker welcome reception with oracle readings, oracle deck eye candy and the chance to create and share your first card. For those interested, we will embark on a group dinner afterward and continue to get to know one another! We will spend the following 2 full days (Friday & Saturday) in the studio from 9 am -6 pm each day creating our decks. at least 1 water-soluble pencil and/or crayon (carand’ache is a wonderful brand). *If you would like to have any supplies waiting for you, please zip Kristin an email. You may also register for the entire weekend by using our “$99 Holds Your Spot” deal which allows you to pay over time. Please note that your $99 deposit is nonrefundable but is applied to your balance. The $329 balance is due no later than June 1, 2019, and can be made by mailing a check to Ephemera Paducah, 333 N. 9th Street, Paducah, KY 42001 or on this page via PayPal or Credit Card. Not paying your balance before June 1, 2019, will result in the loss of your deposit and place in class. Please note that your $99 deposit is nonrefundable but is applied to your balance. The $329 balance is due no later than June 1, 2019. Not paying your balance before June 1, 2019, will result in the loss of your deposit and place in class.